SAN RAFAEL, CA, Jan 23, 2019 — Autodesk, Inc. (NASDAQ: ADSK) has completed the acquisition of BuildingConnected, a leading preconstruction platform, for $275 million net of cash acquired. Autodesk funded the transaction using cash on hand. 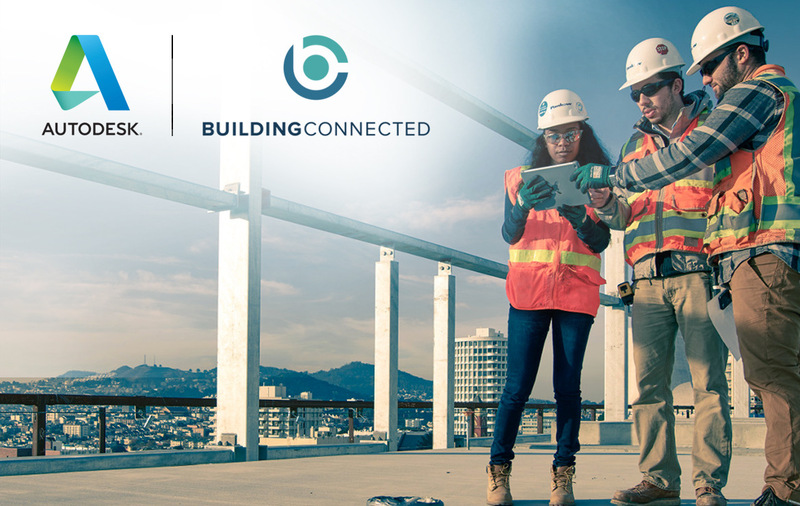 BuildingConnected is the largest and most active digital network in the construction industry with 700,000 construction professionals using the platform. It centralizes the bid management process and simplifies communication to make finding, qualifying and selecting the right subcontractors or responding to the right project opportunities fast and easy. Owners and general contractors use BuildingConnected to manage the bidding, qualification and bid evaluation process from one central location, while subcontractors and vendors can manage their opportunities and win more work. Autodesk plans to integrate workflows between BuildingConnected, Autodesk BIM 360, Revit and AutoCAD, as well as PlanGrid and Assemble Systems, to provide a comprehensive construction offering that addresses the critical processes and workflows across the project lifecycle from start-to-finish. For more background on the BuildingConnected acquisition, please see the accompanying FAQ. The acquisition will have no material impact on Autodesk’s fourth quarter and fiscal year 2019 guidance issued on November 20, 2018. For fiscal year 2020, Autodesk expects an immaterial revenue and Annualized Recurring Revenue (ARR) benefit from BuildingConnected and a slightly dilutive impact to profitability and cash flow. Inclusive of the transaction, the company is maintaining its free cash flow goal for the year. This press release contains forward-looking statements that involve risks and uncertainties, including statements regarding: the impact of the acquisition on Autodesk’s guidance issued on November 20, 2018 and business performance; the impact of the transaction on Autodesk’s and BuildingConnected’s products and services capabilities, customers, and partners; Autodesk’s plans to improve construction workflows and create a digital marketplace for the global construction industry; and Autodesk’s expectations regarding the success of its construction business. Factors that could cause actual results to differ materially include the following: Autodesk’s ability to successfully integrate BuildingConnected’s business; whether the construction industry grows as anticipated; the competitive environment in the construction industry and competitive responses to the acquisition; Autodesk and BuildingConnected’s success developing new products or modifying existing products and the degree to which these gain market acceptance; general market and business conditions; and unanticipated impact of accounting for acquisitions. Further information on potential factors that could affect the financial results of Autodesk are included in Autodesk’s Annual Report on Form 10-K for the fiscal year ended January 31, 2018 and Quarterly Reports on Form 10-Q for the fiscal quarters ended April 30, 2018, July 31, 2018 and October 31, 2018, which are on file with the U.S. Securities and Exchange Commission. Autodesk disclaims any obligation to update the forward-looking statements provided to reflect events that occur or circumstances that exist after the date on which they were made. For more information, please visit the Autodesk Newsroom. BuildingConnected is a leading preconstruction platform enabling real estate owners and general contractors to hire qualified contractors for their projects. BuildingConnected’s mission is to connect every business in the $10 trillion construction industry and to strengthen the lives, jobs, and relationships of millions of hardworking construction professionals worldwide. From the new arenas for the Golden State Warriors and Los Angeles Rams, to local schools and hospitals, BuildingConnected’s tools are helping cities grow and bringing communities together. Autodesk makes software for people who make things. If you’ve ever driven a high-performance car, admired a towering skyscraper, used a smartphone, or watched a great film, chances are you’ve experienced what millions of Autodesk customers are doing with our software. Autodesk gives you the power to make anything. Autodesk, AutoCAD, BIM 360 and Revit are registered trademark of Autodesk, Inc., and/or its subsidiaries and/or affiliates in the USA and/or other countries. All other brand names, product names or trademarks belong to their respective holders. Autodesk reserves the right to alter product and services offerings, and specifications and pricing at any time without notice, and is not responsible for typographical or graphical errors that may appear in this document.